Don Robins continues the series on creating Creating Lightning Components (3 of 6), discussing action and event processing on both client-side and server-side. This series introduces you to the Lightning Component Framework through a free online course by Salesforce University combined with a six part blog series written by Don Robins, a Salesforce MVP, Certified Advanced Developer and Certified Salesforce Instructor. Each post provides deeper insight and additional perspective around topics covered by each course module. If you read our last post (the second in this series) and watched Module 2: Component Markup and Style of our online course Creating Lightning Components, you learned a bit about the component bundle, and the markup and style resources within a bundle where developers create the presentation for a component’s user interface. However, even the coolest looking component isn’t of much use if it doesn’t do anything. Beyond basic presentation functionality, the components you write will also likely need to manage your Salesforce data, as well as execute server-side actions and business processing. In Module 3: Binding to an Apex Method you’ll be introduced to how we add the logic necessary to fetch the data from Salesforce that will be displayed when a component first appears, as well as the principals of action processing. While actions can raise events, events are not always explicitly raised by actions. For example, consider when a component needs to do something, but that process is not explicitly activated by a user interacting with an HTML element in that same component. In Lightning, we have the ability for certain events to be implicitly raised when something happens to the component itself. We depend on such events to invoke logic when initializing a component. For example, if we want our component to display data when it first appears, we need an event to activate logic to fetch data and set the view to display it. Such load behavior is built into the Visualforce model, and we also have the ability to invoke custom behavior on load of a Visualforce page by utilizing the action attribute on the apex:page tag. 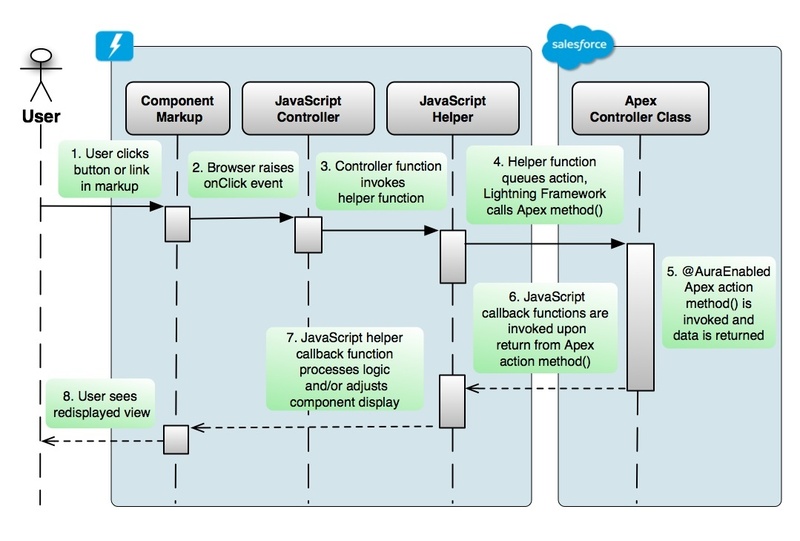 Using that attribute, a Visualforce developer can bind the page to a server-side Apex controller method that will be invoked implicitly when the page first loads but before it is rendered in the browser. Here’s a slightly different sequence diagram to help visualize what’s happening when a user interacts with the app in some manner that causes a new instance of a component to load. For example, a component can be instantiated as a result of selecting a menu navigation item, or perhaps by clicking on a link in a list. The component would need to fire off some server-side Apex logic to fetch some data to display as it initializes. The only difference to the prior example is that the registered init event is raised implicitly when the component loads. 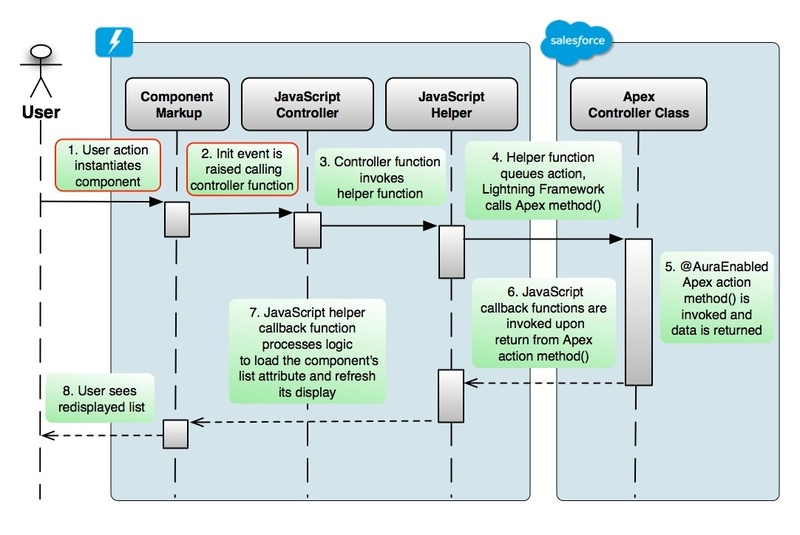 That event calls the controller function, which in turn calls a helper function to queue an action that will result in the execution of a server-side Apex method to fetch and return data. In a subsequent post we’ll review in more detail how the Lightning Framework batches its calls to server-side actions resulting in less chatty and more efficient action processing. As you can see, there are more moving parts, all necessary for a component to be able to respond to both what happens in the client, as well as whatever happens server-side. Lightning Components provide the scaffolding and repeatable patterns that really help manage all of these moving parts. Once you get to know these patterns, they’re quite digestible, so go watch Module 3: Binding To Apex of Creating Lightning Components to see how it’s all done. Don Robins is a Force.com MVP, Certified Advanced Developer and award winning Salesforce University Certified Instructor. Since 2010, he’s been delivering the core development curriculum to hundreds of customers in both public and private workshops for Salesforce University in the US and abroad. As an independent Training Delivery Partner through his company Forcementor.com, he leads and mentors a team of certified Salesforce instructors, curriculum developers and technical authors. He found his way onto the platform as a consultant and developer in 2009, after two decades of building custom business applications with a metadata, framework-based approach. Ever since, his primary focus has been to educate developers and the business community on Salesforce1 and to evangelize the platform.